However, when it comes to crossovers rather than resubmissions, I have had good fortune submitting to PCGS old small ANACS holders. Just as Rattler coins vary in terms of consistency, when viewed in light of current-day standards (see PCGS Photograde™ Online), so do coins in old small ANACS holders. The difference is fewer coins in old small ANACS holders have been submitted for crossover, and spectacular finds are still available at discount prices–provided, once again, that you know how to grade. I spend a lot of time online and at shows assessing which ANACS coins to purchase. The consistency is more unreliable than PCGS OGH coins, and overgraded examples are easy to dismiss. Undergraded ones are rare, but do occur. 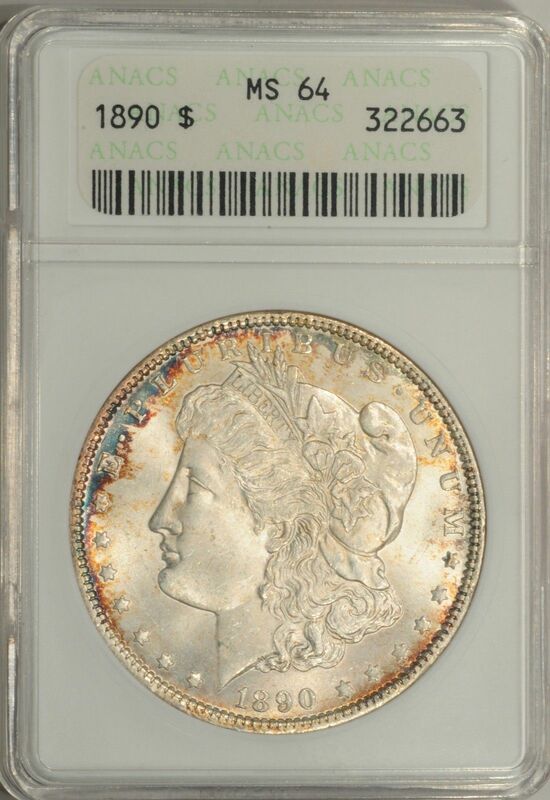 Correctly graded ones are relatively plentiful and can bring a nice premium in a PCGS holder if you are an investor or an inexpensive addition to your set if you participate in PCGS or NGC registries. After several months of cherry-picking small ANACS coins, I sent in two crossover submissions to PCGS. 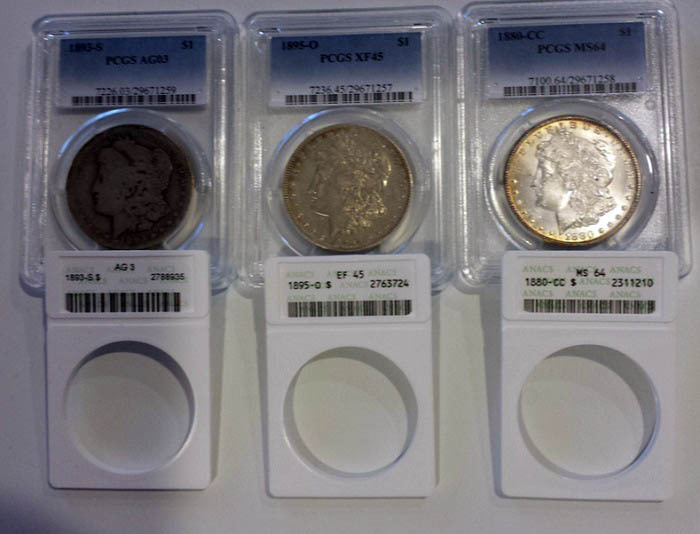 These three pricey coins–an 1893-S AG3, an 1895-O EF45, and an 1880-CC MS64–all crossed over. Typically, only about a third of coins in other slabs cross over to PCGS. That has less to do with the company’s high standards as the submitter’s grading eye. And that’s the lesson of this post. To become an accurate grader, you need to view dozens if not thousands of coins until you can establish accuracy by testing your eye with a crossover submission. I like PCGS Photograde™ Online because you can study characteristics at length and relate them to the coins you own. The trick is to be conservative in your appraisals. For instance, even though there are exceptions, I will reject as a candidate for gem MS65 one small bag mark–even in the field, rather than on the cheek–on the obverse of an otherwise pristine Morgan dollar. 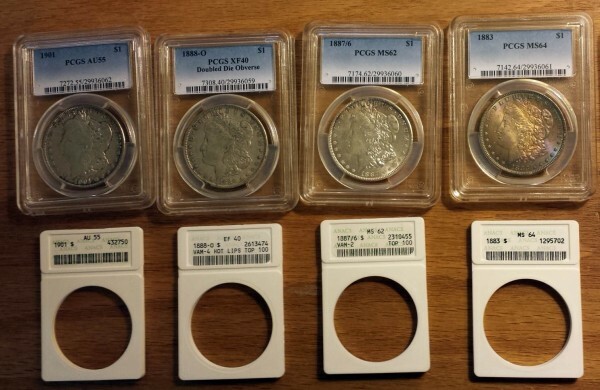 Because of my budget, buying and sending in to PCGS crossover coins is the only way I know how to enhance my set registry at bargain prices. Have you had luck with old small ANACS coins? If so, please tell us about that! Anacs provides great service at much more reasonable rates. Turnaround times are very good and special offers save you even more. Direct submission and online tracking saves time and money.